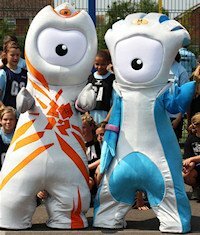 The organisers of the 2012 Olympic Games and Paralympic Games have unveiled the official Olympic and Paralympic Mascots, Wenlock and Mandeville. Their background is grounded in British, Olympic and Paralympic history and they were "created" from the last two drops of British steel used for the construction of the final support girder for the London 2012 Olympic Stadium. This is Wenlock, the official mascot for the London 2012 Olympic Games. So how did he get his name? Well, it's inspired by Much Wenlock in Shropshire, a town that's at the heart of Olympic history. 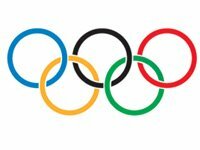 In the 19th century, Baron Pierre de Coubertin was invited there to watch the "Much Wenlock Games" which were inspired by the Olympic Games of ancient Greece. De Coubertin was inspired by the Wenlock Games too, and went on to found the modern Olympic movement. The Much Wenlock Games are still held annually to this day. So what are Wenlock's most distinctive features? The light on his head is inspired by the lights on London's iconic black taxis and the shape of the front of his head is based on the shape of the Olympic Stadium roof, whilst his eye is a camera lens, capturing everything he sees. And the three points on his head represent the places on the podium where successful athletes stand to receive their medals and the bracelets on his wrists are friendship bands, in the colours of the five Olympic rings. 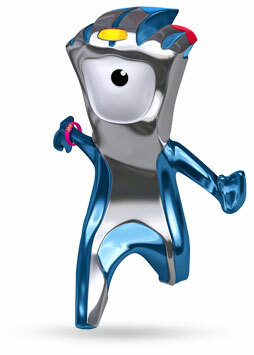 This is Mandeville, the official mascot for the London 2012 Paralympic Games. Well, his name is inspired by Stoke Mandeville in Buckinghamshire ... the birthplace of the Paralympic Games. On the same day as the Opening Ceremony of the London 1948 Olympic Games, Sir Ludwig Guttmann held his own sport competition in Stoke Mandeville for World War Two soldiers with spinal injuries. It was no coincidence - Sir Ludwig dreamed of a "parallel Olympics" for athletes with disabilities. The Stoke Mandeville Games grew and grew until they became the Paralympic Games. So what are Mandeville's most distinctive features? His eye is a camera lens, capturing everything he sees, whilst his head has three prongs which represent the three parts of the Paralympic emblem. Like his tail and hands, they're aerodynamic, which is really important as he's a "spirit in motion", always rushing around, constantly trying to beat his personal best. The personal best timer on his wrist helps him to keep track. The light on his head - inspired by the lights found on London's iconic black taxis - helps him to see where he's going. "We've created the 2012 Olympic Games Mascots for children. They will connect young people with sport and tell the story of our proud Olympic and Paralympic history. By linking young people to the values of sport, Wenlock and Mandeville will help inspire kids to strive to be the best they can be. Both Wenlock and Mandeville constantly try to achieve their personal best and encourage others to follow them. "It's hard to imagine a mascot more in tune with the times. Wenlock and Mandeville will prove a winning formula - a solid coalition that will capture our imagination and help build a lasting legacy for our fabulous Games." "Since 1972 when Waldi became the first official mascot of the Olympic Games, mascots have played an integral part in the story of their edition of the Games and Wenlock is no exception. Linking a British event that was one of the inspirations for the modern Olympic Games to the 30th edition of the Games, Wenlock will undoubtedly help to spread the message of Olympism across Great Britain and the world, while entertaining young and old alike." 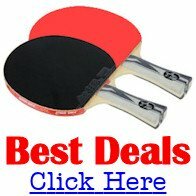 "The mascot for the London 2012 Paralympic Games is marvellous. 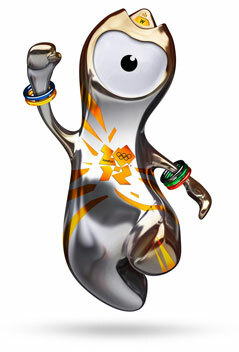 I congratulate the London 2012 Organising Committee for the excellent choice of this unique mascot. During its journey in the upcoming two years, Mandeville will report about the Paralympic Movement and inspire people to learn about the Paralympic values and achievements of Paralympic athletes. I am sure that it will be loved by children all over the world."